In 2017, people around the world will take an estimated 1.2 trillion digital photos, according to digital imaging research firm InfoTrends. But how many of those photos will be printed out? Probably not many. Prynt, a startup founded in 2014, is trying to revamp the way digital content is shared -- with photo-printing, augmented-reality-powered devices for smartphones. 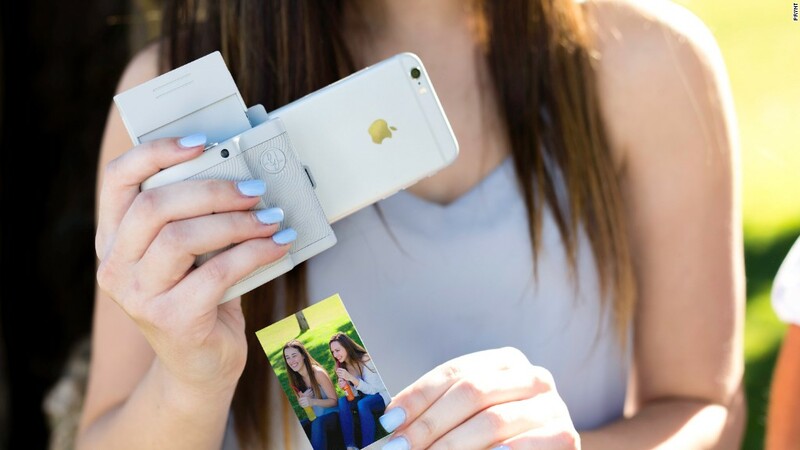 Prynt first launched a photo-printing phone case in 2015 on Kickstarter and now is unveiling a second-generation version. CNNTech got an early look at the new "Prynt Pocket," which is available for $150 starting Tuesday. 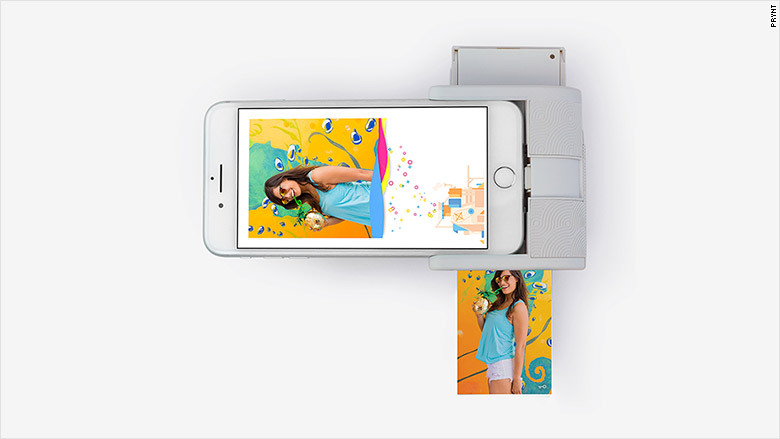 The Prynt Pocket, which lets you print photos directly from your iPhone, is about half the size of the original and can now be used without having to take off an existing phone case. The idea is that digital and physical don't have to be mutually exclusive: Users can capture the moment automatically with both a physical photo and a social-media-friendly video. Here's how it works: Download the Prynt app, slide the gadget onto your phone and snap a photo (or choose an existing picture from social media or your camera roll). You can add special effects like filters, stickers, text and frames, and the image prints in about 30 seconds. The device also has augmented reality video features, similar to Apple's (AAPL) moving image format called Live Photos or Instagram's Boomerang app, which makes short videos that loop back and forth. When you take a photo, the Prynt app records a video and stores it in the cloud. After the picture has been printed, use the app to see the moving photo or share it on social media. "It's the best of both worlds: You get something that is tangible, unique...but you also have a sense of the context of what happened at that time," Prynt cofounder and CEO Clément Perrot told CNNTech. Perrot says people are "living memories as a group" -- everyone takes videos at events like weddings. "Here's a way to capture all of that and put it into something that people would look back at. If it stays on their phone, you don't necessarily look at it again," he said. Both versions of the product use Zink's inkless paper, so no ink cartridge or toner is needed (the ink is activated with heat). The Prynt Pocket holds 10 sheets of paper at a time (a pack of 40 costs $20). The Prynt Pocket works only on iPhone currently but an Android version will be available later this year. Other companies have developed portable printers designed for smartphones, like HP's Sprocket photo printer and Polaroid's instant mobile photo printer (both sell for $130 at Staples). Instant-film cameras, like those from Fujifilm and Polaroid, have also made a comeback in recent years. "People are going back to instant photographing [because] digital photography is missing some of the nostalgia that physical photos have -- the fact that you can touch something and go back to it," Perrot said. Prynt's products aim to be "a simple context to bridge the physical and digital," he said.